Superdry women’s slim chevron funnel puffer jacket. 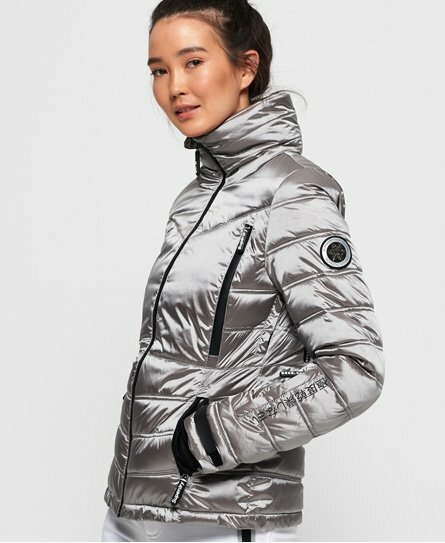 Hit the slopes in style this season wearing the slim chevron puffer jacket, a flattering yet practical jacket to keep you warm and protected tearing up the snow. This jacket features a ski pass holder, ergonomic adjusters throughout and discrete pit zip venting to cool you down when things get too heated on the slopes. This jacket also has a super soft lining on the body, a snow skirt to keep the snow out and two inside popper pockets. On the outside, this jacket also has four external zip pockets, hook and loop cuffs with thumbholes and Superdry branded zip pulls throughout. For the finishing touches, this jacket has a Superdry badge on the sleeve, an embroidered Superdry logo on the shoulder and Japanese inspired logos on the placket and arm.